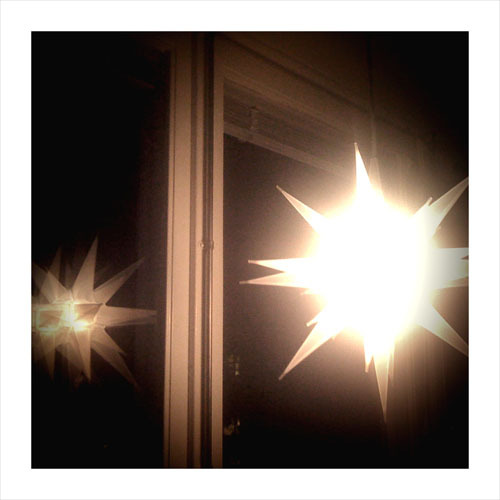 iPhone photography: Advent star with window reflection. If you've heard my laments about the lack of sunlight this winter, you can probably imagine how poor the lighting conditions are for photography. So I gave up on waiting for sunshine, and I also wanted to show you some of my Christmas lights, so I reminded myself of how much I love the spontaneity of lo-fi photography . The gritty grain, the distortion, the overload and the pastels. Like playing rock 'n' roll, like feeding the distortion of your electric guitar back into the amp, like feeling the base in your body before you let your guitar play the sweetest song. Raw emotions with a minimum of editing and styling. iPhone photography: Christmas lights on the balcony.